The final response opportunity is most relevant to initial response, which often is the responsibility of a local fire department or agency. Data from NFIRS were examined and indices computed of the numbers of buildings involved per incident and the relative frequency of reported accidental human-caused ignitions. 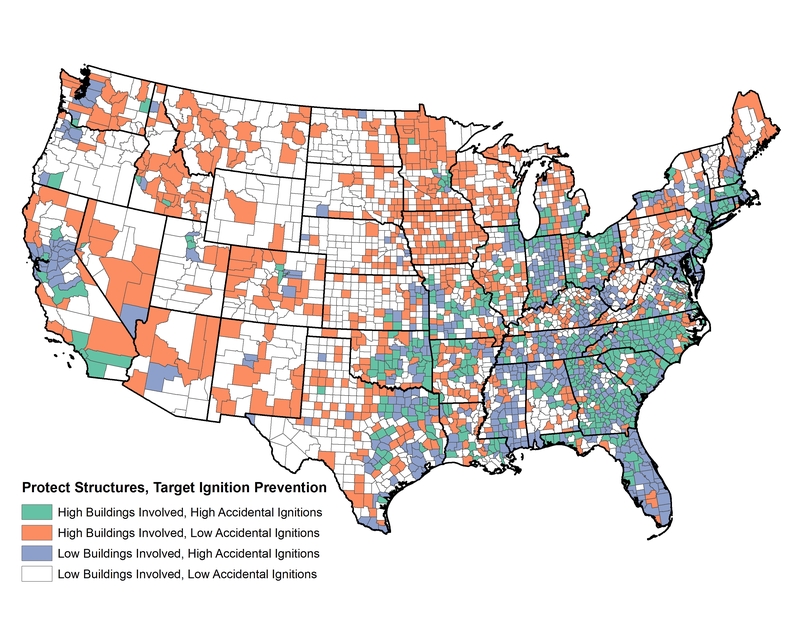 The intersection of higher-than-normal values for these variables indicates that the number of buildings involved per reported incidents is one of the few variables lacking a strong geographical pattern. In contrast, the relative frequency of accidental ignitions tends to be higher in the East and more populous areas of the West. The intersection of these two variables has an interesting pattern that illustrates the widespread extent of the challenges in managing wildfire risk and offers a guide to matching structure protection with prevention efforts (Option 10, figure 3.18). Reducing human-caused ignitions should result in a commensurate reduction in the workload of local response organizations and considerably less risk to structures throughout much of the East and populous Western counties. Throughout much of the remainder of the country, it is expected that buildings frequently will be involved in local incidents, even if the overall number of responses is relatively low. Conclusion: Initial and extended responses are complex and difficult to analyze, particularly at a national scale. Examining data on area burned, structures lost, and patterns of accidental ignitions provides a backdrop for understanding some of the response challenges facing local, state, tribal, and Federal fire departments and agencies.